This version of the RMi Series power supplies from corsair comes with a total power output of 1000W. The RM1000i gives you extremely tight voltage control with near quiet operation. The 80PLUS GOLD rating on this PSU reduces operating costs and excess heat. It also features a fully modular cable set, these DC cables makes building and upgrading your PC easier and leaves it looking great. The Zero RPM fan mode ensures virtual silence at low and medium loads. 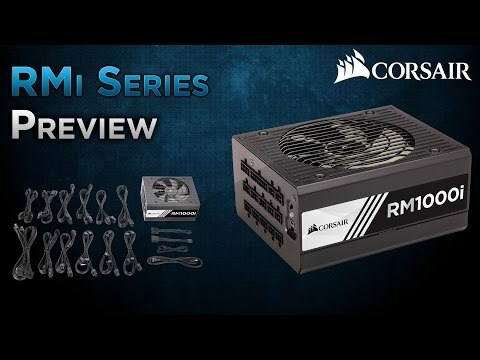 The RMi Series also features the Corsair Link Digital which makes it extremely easy to monitor the power supplies performance along with toggling single rail or multi rail modes, or controling fan speed directly from your desktop. The fully modular design of the RMi power supply means that during your build you can mount the PSU in the case first and then attatch only the cables you need, making builds and upgrades easy with great looking results. In addition the advanced desktop app lets you monitor and log fan speed, voltages and power consumption, as well as control and configure +12V rail operation. 1000W Corsair RM1000i, Full Modular, 80PLUS Gold, SLI/CrossFire, Single Rail, 83.3A, 135mm Fan, ATX PSU is rated 4.2 out of 5 by 9. Rated 5 out of 5 by paranoidsystems from Great PSU. I use this in a home server. The Corsair link software is actually pretty useful to see real-world load. I am powering 15 drives, 4 SSDs 20 cores 96gb of ram and one Quadro. I have yet to see it go below 90% efficiency even during startup where all 15 drives are hammering the PSU. everything stays rock stable at 100% load. Really a great product and I feel quite well priced for what it is. Dont cheap out on your PSU. a good PSU will last you. Rated 5 out of 5 by rahanullah from Very good power supply This is a very good power supply. I've been using it for while now and it's been great so far. I do like the Corsair link software where you can see the power usage etc. Rated 5 out of 5 by NorBdelta from Very quiet with an exceptionally long warranty for a pice I personally went for it because of the 10-year warranty and the fully modular design. Very sleek and very quiet when the fan is in operation. Apart from the specifics, included is a handy bag to store the cables you are not using and a single USB motherboard header cable for the monitoring functionality. The monitoring functionality via a USB header is a nice tool but I rarely use it but for those who do like to tweak and keep an eye on any aspect of their PSU operation it is an excellent feature. It comes with a handy feature that stops the fan when the load is low. So unless you are going to power a few GPUs it will probably stay off. It would be nice if the limit could be adjusted and considering the price I would have expected it. For the price, I am disappointed Corsair did not include cable clips for cable management, such as an ATX set of clips and some PCIe power cable clips as well as some SATA power ones. A disappointment but not a deal breaker. Its overkill for my setup as I only have a Gigabyte 1080 G1 and an i7 6700k. Overall I would definitely recommend it, the warranty alone makes this a perfect buy even when considering the price. Rated 5 out of 5 by Toots3D from Power to the PC. I needed a psu that had 1000 watts and this does not disappoint. It is fully modular and comes with a large selection of leads. You can connect it to the motherboard via an usb cable, to see and regulate all the voltages. The first one I had was faulty, but Scan came to the rescue and I soon had a new working one. It is quiet and the fan stops turning at low loads. All in all a great psu. Rated 5 out of 5 by Bails from Powerful skylake build with i7 6700, 980ti classified and watercooling and the fan still doesn't turn and it's Def not broken, this thing is a powerhouse. and the monitoring software is pretty good too. Rated 5 out of 5 by ro55mo from 1000W Corsair RM1000i Very nicely built unit. Operates around 26C and pulls 112 watts in for 98 watts out when idle. System comprises of an Intel Core i7-4930K Ivy Bridge, five hard disks (SSD & HDD) with two GTX 970s. Very happy I could face the unit fan down to pull air from outside the case through a dust filter. Makes the system noticeably quieter as the fan is not operating below 40C. A little on the pricey side but I believe I will get many years trouble free use from it. And of course you should never cheap out on a PSU.